What if I don't like the artwork? We can make as many changes as necessary. We prefer to limit changes to 3 per custom coin design but we understand that there are exceptions. There is no reason a customer should not be satisfied with our artwork. What material will my coins be made of? We offer two types of coins. 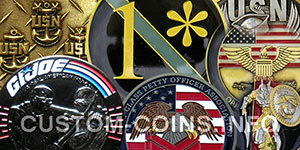 Die struck brass based coins and die cast zinc alloy coins. The brass based die struck coins are more expensive and have a heavier feel to them than die cast zinc alloy coins. You can choose to go with the less expensive die cast option if you prefer. [You may not have a choice for special shaped coins or coins with holes in them such as bottle opener coins] I highly recommend going with the die struck option for round coins. Can changes be made to my coin after I approve a sample coin? The only changes that can be made to a coin after dies or moulds have been created is paint color changes or metal finish changes. Nothing that is part of the die or mould can be changed without incurring additional costs. Who is responsible for spelling errors? The customer is responsible to proof the artwork we send them; proofing artwork requires checking the spelling, text character spacing and text alignment. Please don't assume we're perfect. We are all human and we do occasionally make mistakes. It's always better to be cautious and pay close attention. Orders are final and may not be canceled. Given the custom nature of the coins we manufacture order cancellation is NOT possible.